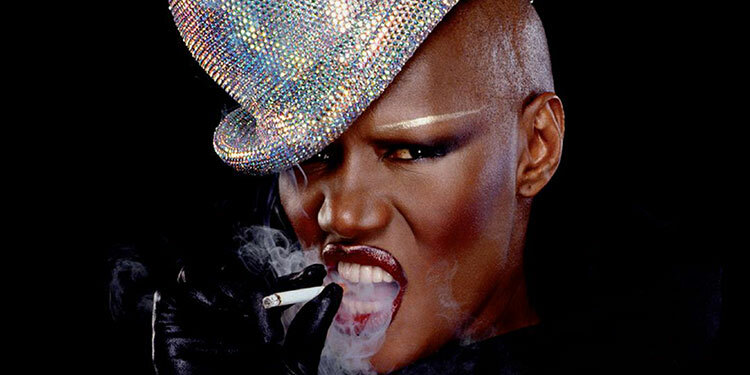 Enigmatic is an overused word, but it’s one that seems to fit Grace Jones. She’s been famous since the 1970s, but quite what and who she is has always been elusive. She’s a model and a singer, she’s been a Bond girl and co-starred in Conan The Barbarian. Her shows could be viewed as Avant Garde performance art or as a use of striking visuals to cover for middling music. Just visually she is iconic – both an archetype of Amazonian warrior femininity (with the most astonishingly long legs), and yet completely androgynous. Jones is also impressively ageless, looking pretty much the same now as she did in the 1980s. She’s someone who seems like we view her through a veil and who isn’t quite on the same planet as the rest of us. To some she is a series of moments – singing while hula-hooping outside Buckingham Palace at the Queen’s Diamond Jubilee Concert, infamously slapping guest show host Russell Harty in the 1980s, or base-jumping off the Eiffel Tower in A View To A Kill. 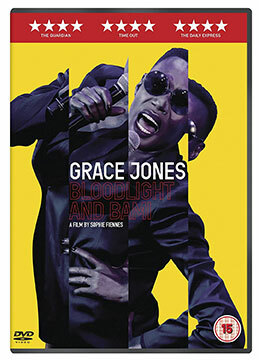 Grace Jones: Bloodlight and Bami is an attempt to break through that enigma, while acknowledging from the start that may not be possible. The public Jones has always seemed like a constructed persona, but the documentary is aware that the constructed aspects of her may be as real as anything else. There are suggestions that she remembers little of her childhood in Jamaica and she has a chameleon-like quality where her accent shifts depending on who she’s talking to. The latter is partially because she’s lived a truly international life, but there’s also something oddly distancing about it so that she constantly seems to be moulding herself to her surroundings, almost as if her entire existence is a confabulation. The camera is given intimate access to Jones and her family, showing moments of her famously explosive temper (and giving her a chance to explain her side of the famous Russell Harty exchange). We see her striking stage shows, which often manage to seem huge, theatrical and over the top, while simultaneously being rather intimate. The film’s verite style is as illuminating as it is infuriating. A more traditional style would have attempted to impose a simpler narrative onto who Jones is – reduce her to some clichés so the audience feels satisfied. However, director Sophie Fiennes realises the truth is more complex than that and so allows Jones and the footage to speak for themselves. By the time the film shows how poor parts of her early life were and how it was marked by harsh treatment by her father, it is a glimpse under the carefully constructed image, but it’s not presented as something which suddenly explains everything (which it would have been easy, but reductive, to do). By the end you do feel as if you’ve seen underneath Jones’ carefully constructed mask, by there’s a feeling that you may still be viewing things from a very oblique angle, and that Jones may be wearing yet another mask underneath – and she could well be, as if nothing else the documentary is testament to how smart she is. You may also have the sneaking suspicion that that the seemingly constructed image of the temperamental, larger-than-life, visually dominant Jones is as true a reflection of the real woman as anything else. It’s not really about what’s underneath the iconic image, as what she’s saying about her truth is already on the surface. Overall Verdict: Although some may wish it presented a simpler narrative with more straightforward conclusions about who Grace Jones is, Bloodlight and Bami is still a fascinating look at an enigma who can’t easily be deconstructed.